J.D. 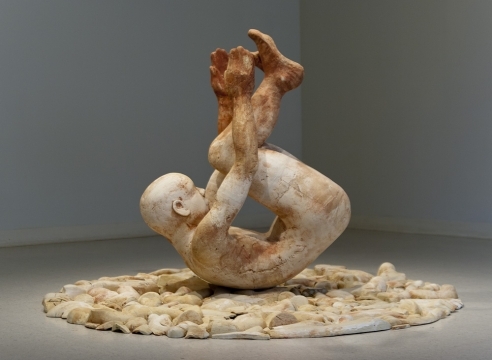 Perkin’s new show, Island, is a large installation piece consisting of 80 larger than life-sized heads, mostly human and a few animal, each individually modeled, arranged in a circular formation approximately 18 feet in diameter. Perkin creates the sense of a "landscape" of people from all walks of life. While there are a few ‘common’ heads, most are wildly colorful, almost tribal. Some are wickedly funny, sprouting horns. There is a head of an African woman with chains for hair. There is a head that looks like Van Gogh, and a head that looks like James Joyce. And there are cubist heads and wolf heads, and there is a head buried up to its nose with a baseball cap that says "J.D." While Island is a somewhat dystopian vision–all humanity crowded together on the last remaining piece of dry land­-–it is a piece of art intended as both tragic and comedic, and, through the use of texture, color and gesture, it is affecting and beautiful. There’s a tantalizing little glimpse of Robert Colescott’s work at Laura Russo Gallery right now. Colescott (1925-2009) was an important American painter, representing the United States in the Venice Biennale in 1997. 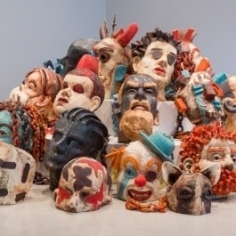 ​The Colescott show hangs in the back galleries at Laura Russo: Up front are dozens of painted ceramic heads by J.D. Perkin. While the Colescott show gives just a suggestion of Colescott’s achievement, Perkin’s is a major exhibition of what seems to be breakthrough work.